Instruction, in several knowledge domains, aims at achieving two goals: acquisition of a body of knowledge and of problem solving skills in the field. In physics, this requires students to connect physical phenomena, physics principles, and physics symbols. This can be learned on paper, but interactive tools may increase the learner’s ability to contextualize the problem. Computer simulations provide students with graphical models that join phenomena and principles in physics. However, a minimally guided approach may make learning difficult, since it overburdens the working memory. In particular, for developing problem solving skills, students need to be guided and exercise with a variety of physics problems. Intelligent tutoring systems (ITS) can be a useful tool to fill this gap. Thus, we have developed a physics game to support inquiry learning and retrieval practicing using simulation and knowledge based tutorship (QTut), and implemented as a puzzle game that uses driving questions to encourage students to explore the simulation. To address scalability and reusability, the game features different difficulty levels atop of a customizable format. This allows us to explore in-game adaptivity, exploiting task and user models that rely on the flow framework. User tests are being executed to evaluate the usefulness of the game. This work was supported in part by the Erasmus Mundus Joint Doctorate in Interactive and Cognitive Environments, which is funded by the EACEA Agency of the European Commission under EMJD ICE FPA n 2010-0012. 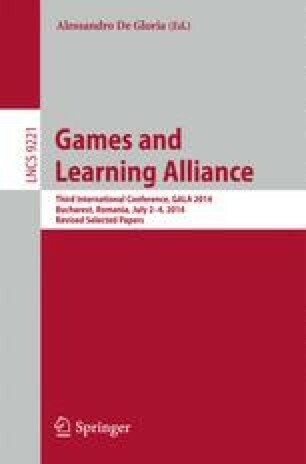 This work also is co-funded by the EU under the FP7, in the Games and Learning Alliance (GaLA) Network of Excellence, Grant Agreement nr. 258169.